Wonderful salad is mildly spicy and tastes even better the second day! 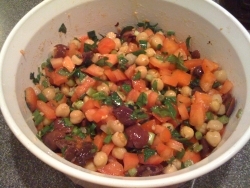 Use canned chickpeas in place of dry - just drain and rinse before boiling. Soak chickpeas in cold water for 12 hours, or overnight. Place chickpeas in a saucepan and fill with salted water. Bring to a boil then simmer for 1 hour, until tender. Drain and set aside. Mix the olive oil, lemon juice, garlic and pepper and whisk together with a fork. Combine all the remaining ingredients with the olive oil/lemon juice mixture and coat evenly. Season with salt and pepper, to taste, and refrigerate until ready to serve. Thanks for expressing your ideas with this blog. Also, a fable rrgiedang the banking companies intentions any time talking about property foreclosures is that the lender will not take my installments. There is a certain amount of time in which the bank requires payments every now and then. If you are way too deep in the hole, they are going to commonly call that you pay that payment entirely. However, i am not saying that they will not take any sort of payments at all. When you and the traditional bank can seem to work something out, a foreclosure process may cease. However, if you continue to pass up payments within the new program, the foreclosures process can just pick up where it left off.